Speedruns have become a popular challenge for players to test their skills. Speedruns have one simple goal, beat the game as quickly as possible with the lowest time. Its like racing, but the opponent is the clock. DoubleDutch and tinyBuild takes the speedrun concept and literally created a game around it. SpeedRunners has players participating in speedruns against each other to see who is the ultimate speedrunner. Does this game run to glory, or is it left behind in the dust? SpeedRunners is currently in the beta stage. 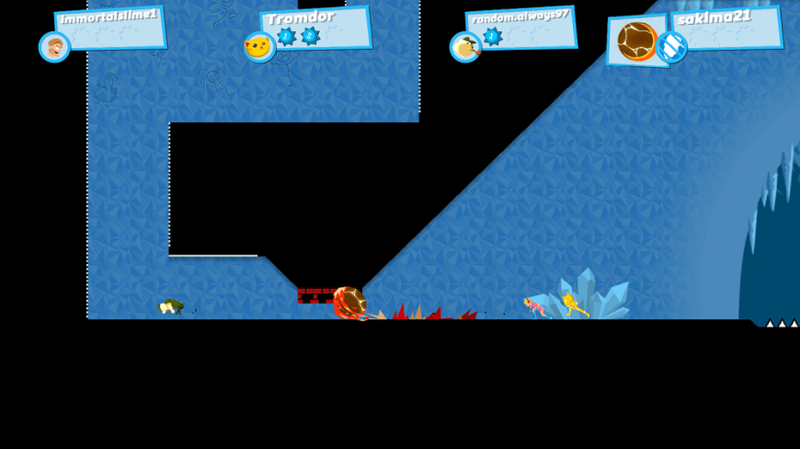 After a quick tutorial, players can jump right in to the action. SpeedRunners is a fast paced game where you need to avoid obstacles and speed through a level before the shrinking screen destroys the player. The game is primarily a multiplayer game. 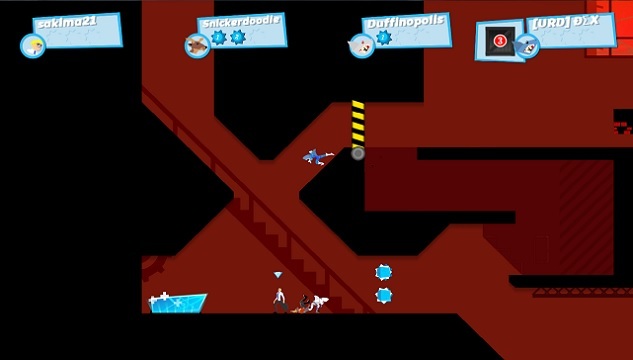 There is a single-player option in the game where you must speed through a level and reach the end of the goal before the time runs out, but it only takes one to two hours to get through that section of the game. The focus of the game is clearly for the multiplayer. The game can either be played against other people locally or online. There are up to 24 characters to choose during each match. All the characters have the exact same gameplay style. The choice of characters is purely for cosmetic purposes. Some examples include Speedrunner, Jailbird, XL, and Scout. Up to four players must race against each other through a particular stage by staying ahead. If someone ends up behind, there are power ups to grab to help catch you up to the competition and prevent your early exit. These include an ice beam, a drill, and the dreaded claw. The claw grabs the character in front of it and pulls him or her back behind the player who used it. If a character ends off the screen, the character is eliminated. The last character remaining wins the round and the first player to win three rounds will win the match. Multiplayer mode can be an addicting experience. If all four players know how to play the game, it becomes a tight race. The game’s visuals are appropriate for both the setting and the gameplay. Some will say the graphics are a bit on the bare side. 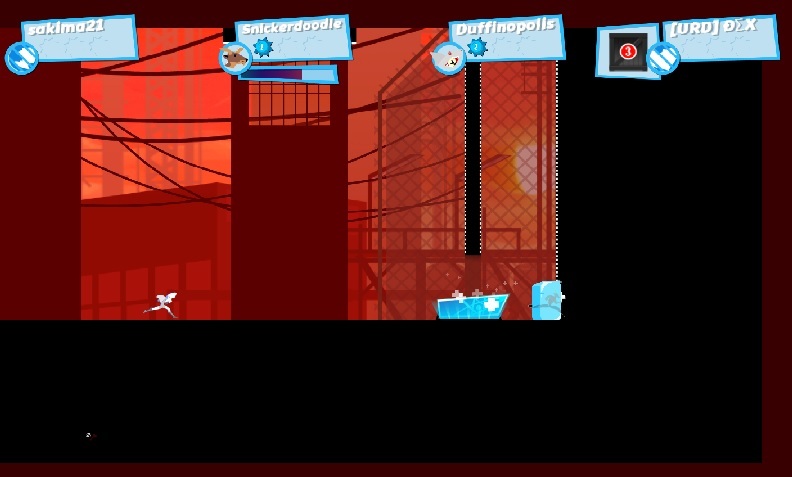 The levels contain some shadow objects and buildings in the background. There is at least some color as well. When a game’s focus is on quick gameplay, the visuals don’t need to be elaborate, as everyone is going to be focused on the action and not the backgrounds. There are only two pieces of music. There is a background theme in the menus and one song during the game itself. While the music is good, I would love to see more variety. Perhaps they are working on the music as the game continues to be developed. For those who want some extra content, there are two DLC packs to purchase. Both DLC packs contain 8 more “characters”. The characters are 8 popular YouTube stars. Some examples include Jesse Cox, Peanut Butter Gamer, Pewdiepie, and Markiplier. Its unnecessary to purchase these DLC packs unless you are either curious or want to play SpeedRunners as your favorite YouTube star. There is one warning I must state to everyone, however. The game may crash from time to time. Fortunately, it has only happened a few times during one day when I was playing the single-player mode. After taking a break from SpeedRunners for several hours, I was able to enjoy the game crash-free. If the game crashes in a particular area, my best advice is to wait a few hours and then try it again. SpeedRunners is a worthy purchase for people who want to enjoy a good fast-paced multiplayer game. Unlike other Early Access games, SpeedRunners is closer to a finished product. Speed runners (no pun intended) will get the most value from SpeedRunners. Since it is an early access game, I don’t have a final score for it, since it is still in the beta stage. Hopefully, we will see it as a full release sooner rather than later. If the game’s concept interests you, I can easily recommended downloading SpeedRunners.